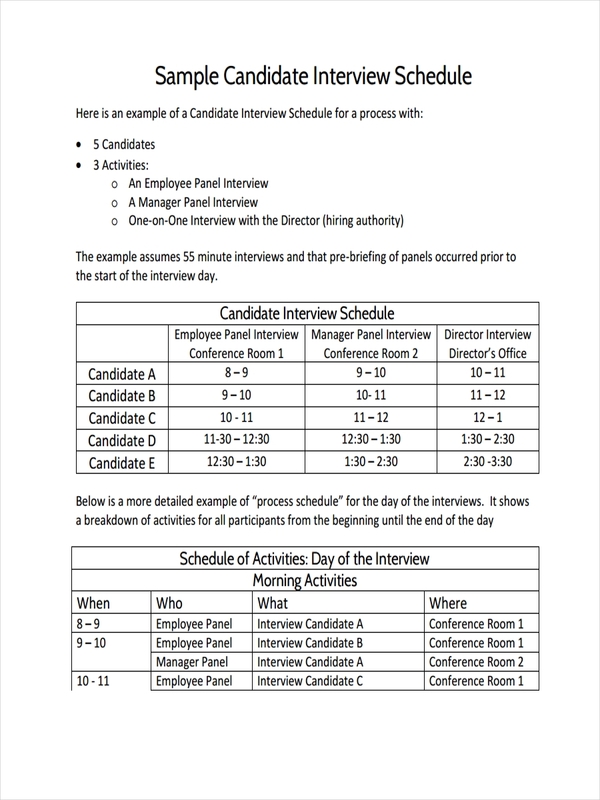 In conducting an interview, an interviewer uses an interview schedule to serve as a guide in the flow or sequence of an interview. 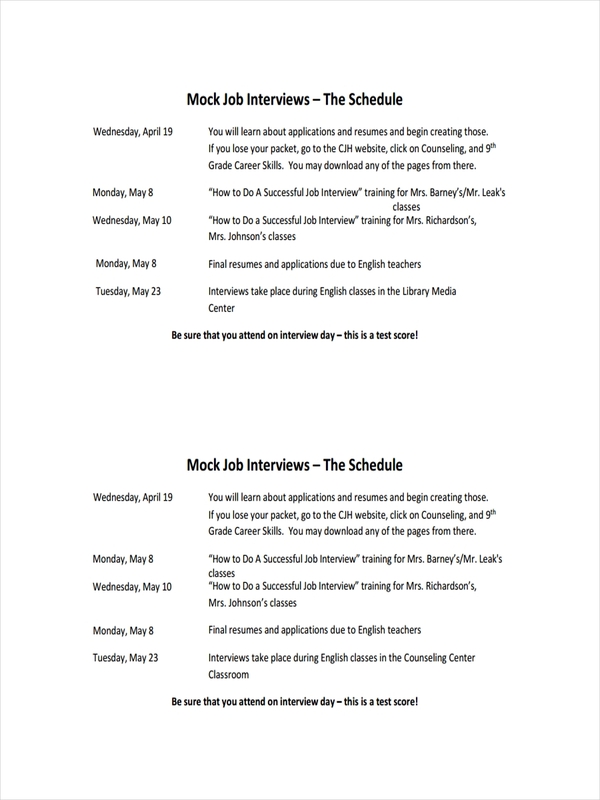 Much like a work schedule, an interview schedule helps direct discussion during the interview by having a ready set of questions. 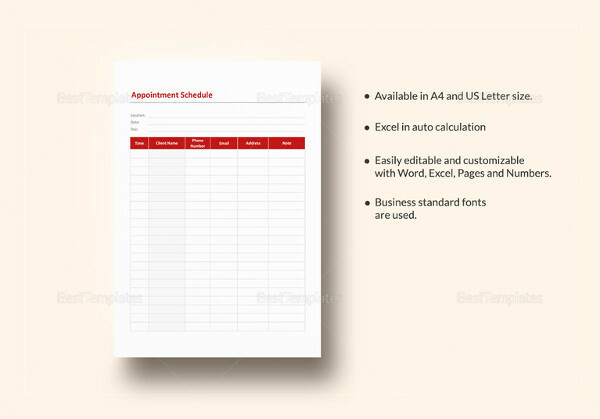 As a daily schedule displays the time allotted for each task or event in a day, an interview schedule also has a predetermined time period for each question and topic. 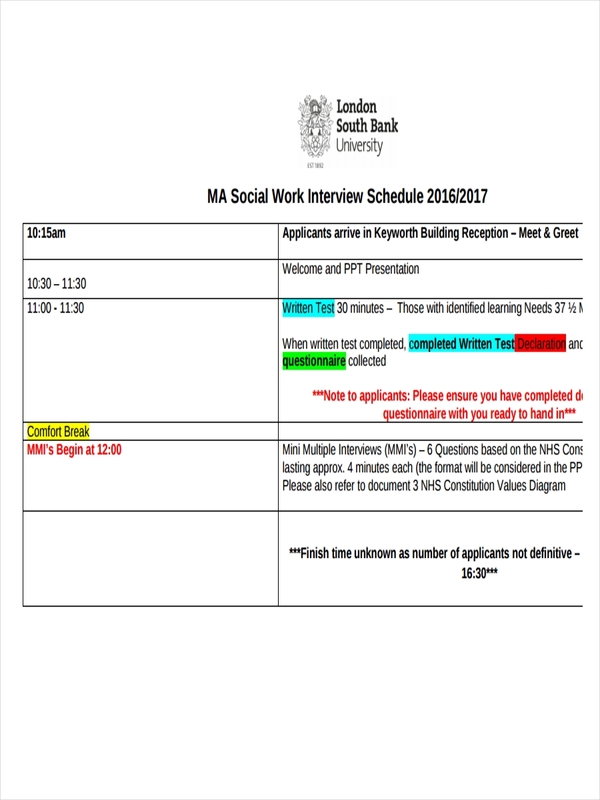 Examples of different types of schedules for interview are found in the page to assist in the better understanding of an interview schedule and how it is structured. 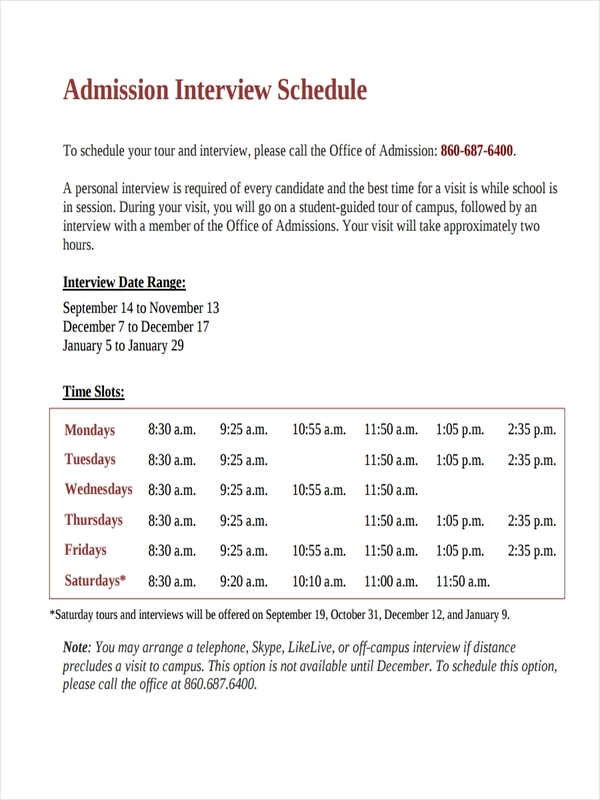 What Is an Interview Schedule? 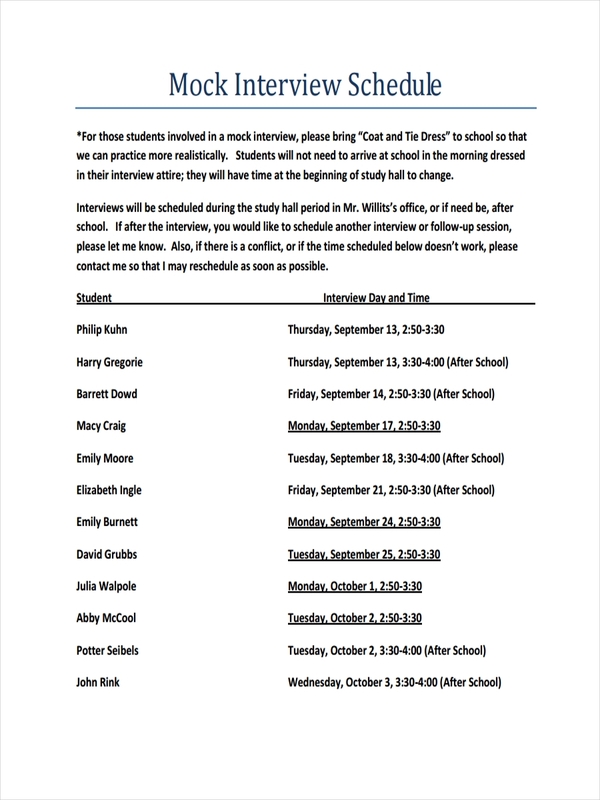 An interview schedule can be called as a technique of individual data collection. The interview itself has many types depending on what statement of purpose one has for the interview. Depending on how it is made, an interview can be structured and unstructured. 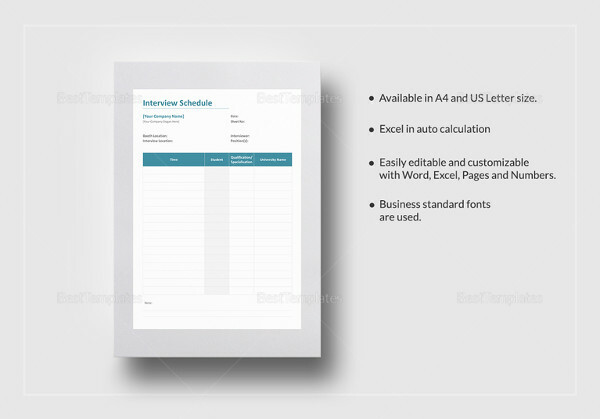 Structured interviews often use predetermined set of questionnaire templates while an unstructured interview is the opposite. 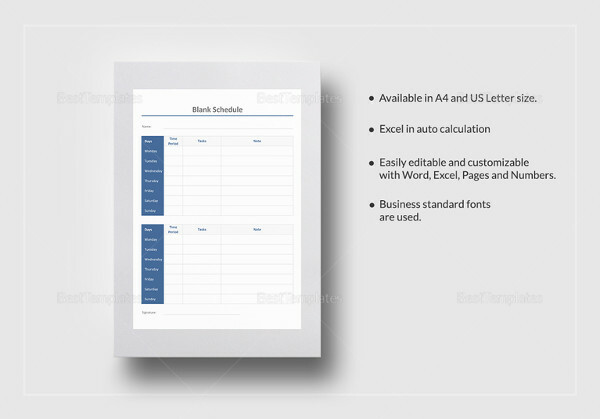 Schedule examples in excel and rotating schedule examples may be drawn or drafted from the current interview schedule samples found in the page. Opening – The opening statement should contain the aim of the interview, topics to be discussed during the interview and the estimated length of the interview. 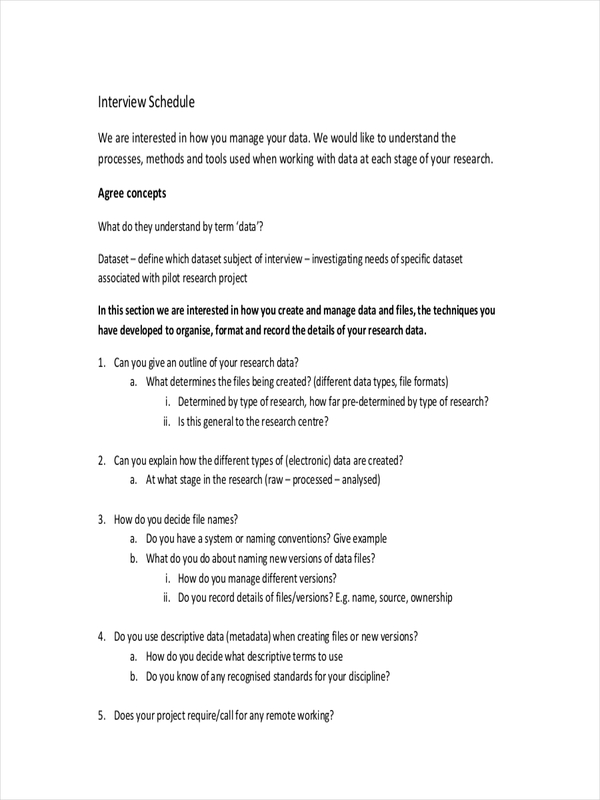 Conclusion – Wrap up of the interview containing the summary of the points discussed during the interview. 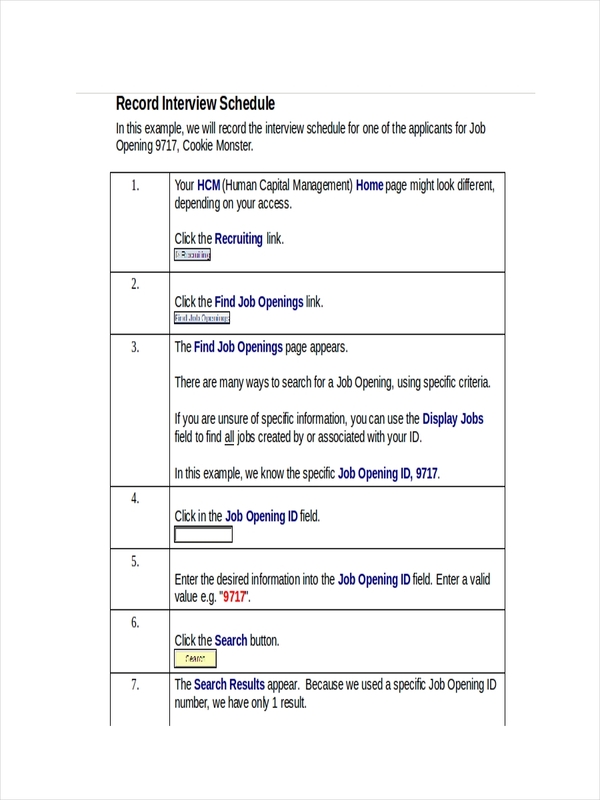 Job schedules closely relate to the interview schedule samples shown in the page. 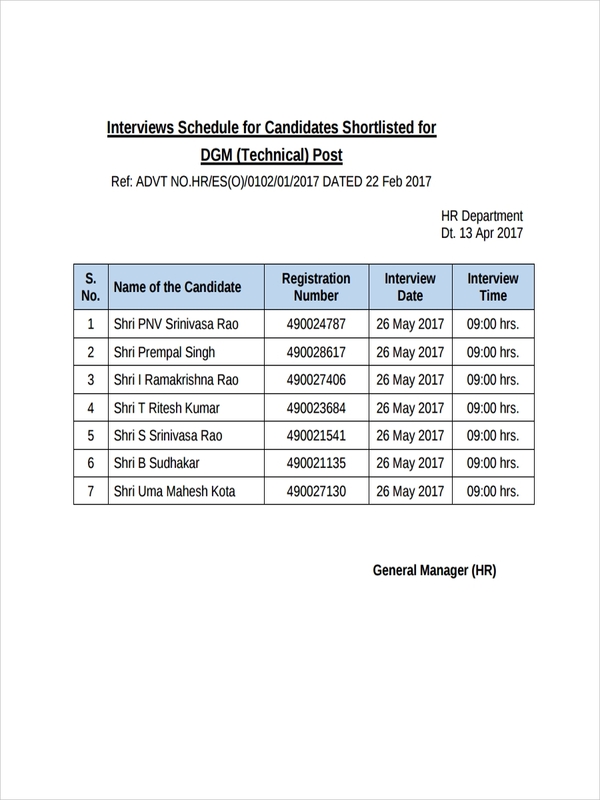 The different interview schedule samples can be accessed by clicking on the download link button below the sample file. 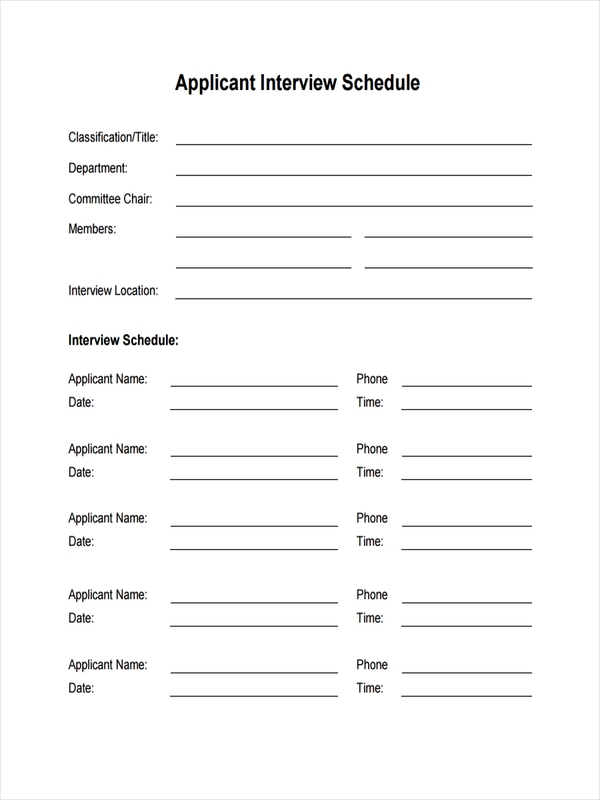 What Is the Difference between an Interview Schedule and a Questionnaire? 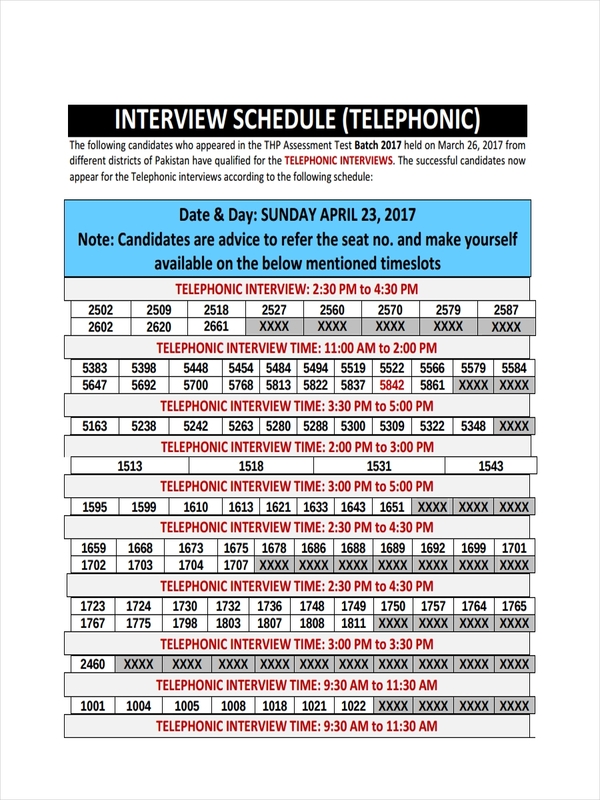 Although an interview schedule and a questionnaire have similarities, the main difference between the two is that an interview schedule is more flexible with the questions in that a follow-up question differs depending on an answer. It is more of a two way conversation between an interviewer and an interviewee. An interview questionnaire, on the other hand, is straight away just asking the questions with no regard to the answers provided. 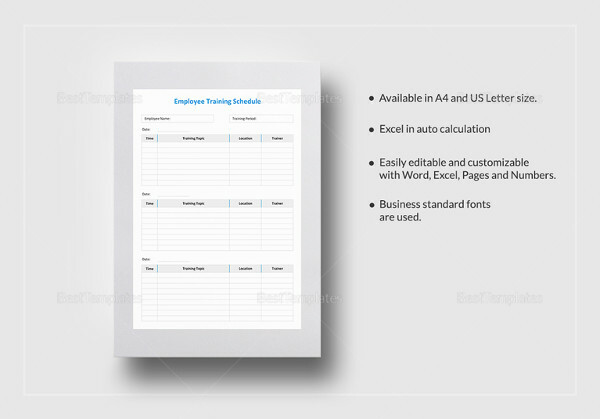 Schedule examples in pdf found on the page are most likely to inspire to making an employee schedule example. Have a look at the samples to find out more. 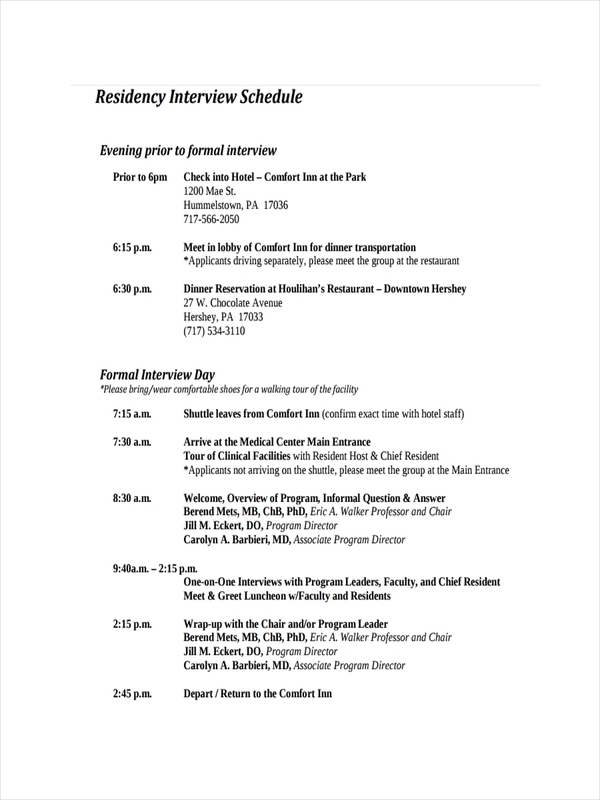 Why Is an Interview Schedule Important? 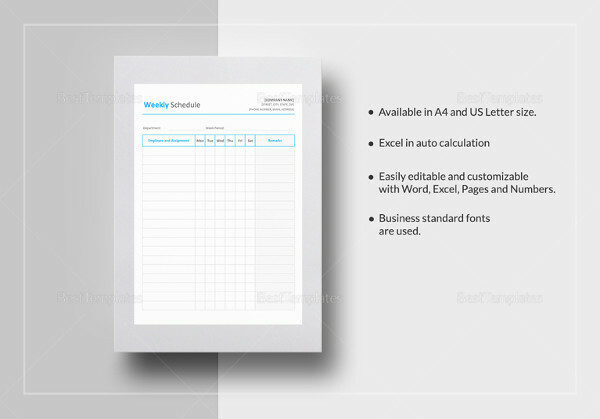 Schedule examples in word and project schedule examples can be made out of understanding how to make an interview schedule. 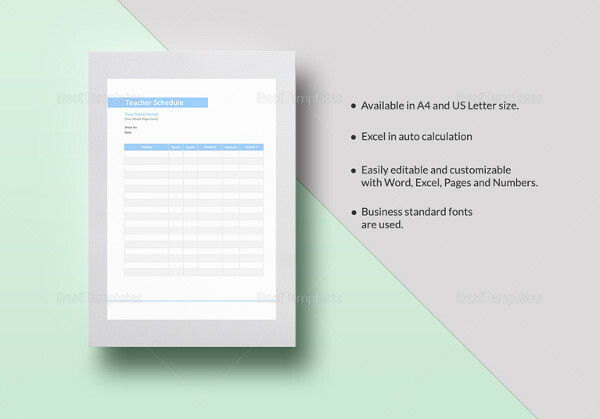 Just click on any sample to access the file.